At the beginning of the year, an amendment to South Africa’s wiring code came into effect which makes a new plug and socket standard, SANS 164–2, mandatory for new installations. SANS 164–2, also known as ZA Plug, has the same hexagonal profile as the Europlug seen on cellphone chargers, but includes an earth pin. It is substantially more compact than South Africa’s three-prong plug standard, and has much thinner pins. 164-2. Socket outlet points may also include socket-outlets complying with the dimensions of SANS 164-1. With the wiring code amendment taking effect in January 2018, each plug point in a new building must have at least one socket that can accommodate a ZA Plug. Cecil Lancaster, a regional director for the Electrical Contractors’ Association of South Africa ECA(SA), said that from the installer’s side there was initially some confusion about the wiring code requirements. There was also some initial resistance due to the price difference between installing an outlet with at least one ZA Plug socket in it, and outlets that only support the older standard. The price has since reduced to the point where it is no longer a factor, said Lancaster. A natural knee-jerk resistance to change has also been a factor, he said. “There was some consumer resistance due to existing appliances bearing the old type plug, but it is mostly satisfied by offering combination socket outlets containing both types,” he said. On whether manufacturers have been supporting the standard, Lancaster said that most consumer goods have been coming with compatible plugs for some time. “Think phone chargers, audio-visual equipment, TVs, DVD players, decoders, kitchen appliances, and similar unearthed appliances,” he said. Lancaster said that it remains a chicken-and-egg situation, however, as the installation of outlets increases, appliances will follow. Conversely, as more appliances come equipped with new plugs, it will stimulate the need for outlets. One obstacle to the transition is that socket-outlet units seem freely available in the retail market, but plugtops less so. To help reduce resistance to the change and further improve uptake, Lancaster said that “reverse adaptors” may be considered. 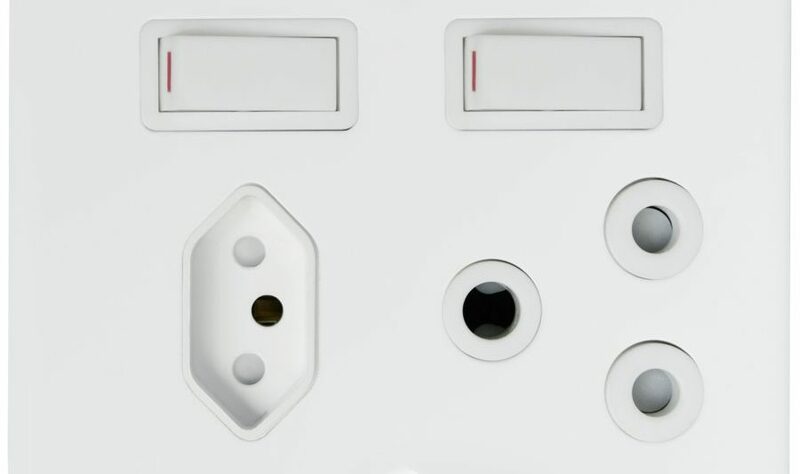 These would make it possible to plug equipment with old type plugs (164–1) into an adaptor which fits into a new socket (164–2). “Such adaptors are currently frowned upon by the powers-that-be because it was seen as a manner of circumventing or slowing down the transition,” said Lancaster. Despite its efforts, commercial and political interests caused the standardisation initiative to fail in Europe. Brazil and South Africa are the only countries to have adopted the standard. As Lancaster mentioned, combination outlets are available which include the old SANS 164–1 socket, as well as ZA Plug sockets. So long as an outlet includes at least one ZA Plug socket, it complies with the wiring code requirements. It is therefore not currently necessary for South Africans to switch the existing electrical sockets in their homes. Q: Do you need pins that could carry 40 A on a 16A system with a 2.5 mm wire and a 20 A circuit breaker in the board? Q: Is this new socket outlet safer than the old type? A: Yes. When a plug is inserted it goes into a 12 mm well, so when the pins touch the live terminals they cannot be seen and interfered with. Q: Are the plug tops available? A: Yes, they have been on the market for eight years but not everyone stocked them. Most of the large wholesalers now have stock. Q: What about appliance manufacturers, are they changing to the new plug? A: Appliance manufacturers have been aware of the new regulations for a while but some have been slow to react, however, now that it’s law, they will have to change.